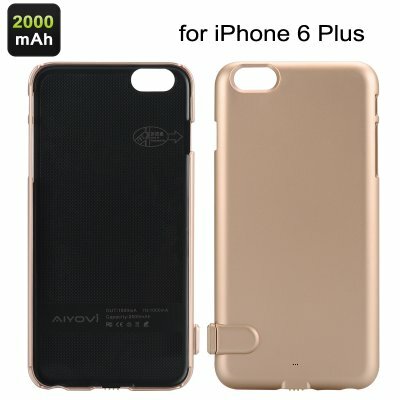 Successfully Added External Battery Case For iPhone 6 Plus - 2000mAh Battery, Power Indicator Light, Recyclable Over 50000 Times to your Shopping Cart. Your iPhone 6 Plus comes with lots of great features and we are sure you want to be able to make use of them throughout the day. Unfortunately, the more actively you use your beautiful smartphone, the more quickly its battery is draining. Unless you always have a power socket nearby and the time to wait for your device to recharge, that can lead to lots of inconvenience and have you falling out of touch at the worst possible times. Luckily, there is a way out. Having an external battery case is a great way to go through your mobile day uninterrupted and not stress out about your phone’s screen suddenly going blank. The iPhone 6 Plus battery case comes with a 2000mAh rechargeable battery, that will always be there to have your back and let you concentrate in your day, instead of roaming the streets for a power plug. The battery case meant specifically for your iPhone 6 Plus and comes with power indicator light, giving you all the necessary notifications and keeping you on track with the charging process. Most external battery cases are quite bulky and might involuntarily spoil the looks of your smartphone. However, this is not the case here. The external battery case for iPhone 6 Plus is slim, light and won’t bend as you put it in your pocket. This External Battery Case for iPhone 6 Plus comes with 12 months warranty. Brought to you by the leader in electronic devices as well as wholesale external battery cases, Chinavasion..